If you enjoyed (or plan to enjoy) The Atlantis Papyrus then you should join my mailing list to get the History Behind the Book which is a short, 30 page companion that covers some of the key events in the book and tells some interesting things about that and lets you know what was real. Well, the History Behind the Book is an attempt to address that, for my novel. Enjoy! BUT DON’T READ IT BEFORE YOU FINISH THE NOVEL, THERE ARE SPOILERS! Those trying to write a novel know the struggle. I guess we all go through the phase of deciding the right tool to write (formatting to be publishing ready is a whole new story), and I went through mine. I’m lying a bit — the above wasn’t even my first option. The true first option was I tried using Microsoft Visual Studio Code with each chapter a text file. Yes, yes, I know, can you believe that! Then, I switched to option two, after purchasing Scrivener which is meant to be a great tool for writing novels. Somehow, I ended up with this. So the experience got mixed — the writing portion felt harder (I know many people vouch for Scrivener, I just couldn’t get used to it) but I managed to fix my research portion by adopting OneNote. As I began to use OneNote I began to wonder why not do everything in OneNote? Would writing feel odd? This final configuration turned out to be surprisingly productive in the following ways. My next book, The Wrath of God, is organized as a notebook by itself. First, let’s talk Meta. You can see all the “pages” on the right side where I capture my research and thinking. 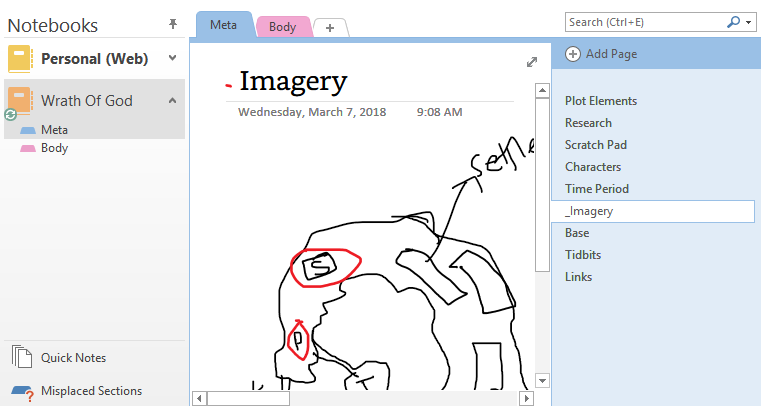 The beauty of OneNote is I can draw on the pages, and some of my work requires plotting via images, and I put that in the Imagery page. Great examples of this are the visuals of the geography of my setting and battle tactics. I have a page called Chapter Template which I copy if I want, for each chapter. The template is configured with the font, table structure, and anything else I want for each chapter. Then, each chapter is a page. The cool thing is I can move chapters around easily, and all my research is a click away. There’s a great OneNote add-in called OneTastic which has macros for various tasks, of which word count is one, and I use that to keep track of chapter lengths. Writing on a OneNote page is not… as elegant as writing on word. See for yourself! But if you’re focused on writing, hopefully the tool does not distract you. There’s no conclusion — this isn’t a recommendation. This is how I’ve organized my writing and it works nicely. If it helps you, great! If not, find a method to your writing madness. Good luck! Update: Jan 2019. Since this article, I have switched over to Ulysses for Mac, which I found to be very productive for my writing. You can follow my Five part posts on my use of Ulysses, starting with Part I. Read the novel that did parts of its journey on OneNote! Did you know that so much is known about Alexander The Great, and yet almost no contemporary literature of his time exists? And that what we have learned about him is almost all from works written hundreds of years after his death? The works of original sources, Cleitarchus, Ptolemy, and Hieronymus, have been lost, so we are left with interpretations and retelling, hundreds of years after the events. In some cases the sources themselves do not agree, which leaves us to our own interpretation of events and characters. I’ve always found such facts fascinating because when we read about ancient history we often forget that the documentation of those times is rife with inaccuracies, assumptions, gaps, confusion and that what we read is often one person's view of what really happened by cobbling together a whole bunch of fragmentary works. Of course, this also makes it possible for someone (like me) to write a novel that can take advantage of certain gaps and build certain stories around them. The Roman empire is a fascinating period in history. We mostly read about the “famous times” of Caesar, Antony, and Octavian (later Augustus), but not much about the long reign of emperors, starting with Octavian in 27 BC, all the way close to 500 AD. It’s a period rich with colorful characters and world-changing events. When we watch TV serials or movies about Rome, we rarely get an idea of the numbers behind the period — how many emperors were really there? How long did they often rule? It sometimes feels like someone came to power, got murdered 6 days later, and *boom* the next guy’s on and so on. This post is an attempt to give the reader an idea of the scale and times, with some interesting facts and tidbits to go along with it. There were about 70 Roman emperors from the beginning (Augustus — 27 BC) until the end (Romulus Augustus — 476 AD). Let’s look at the rule of the first 25 emperors, and the ~number of years each one ruled. Keep in mind that while the period is chronological, some emperors were joint rulers. Augustus, the first emperor, was also the longest ruling emperor — it’s impressive that once he took control after the civil war, he was able to rule and control a growing empire peacefully for over 40 years. That’s a long time when you think about it! The Roman empire ruled for a long time, with many emperors lasting for decades in their rule and not days like we sometimes feel it is. While this article is about the Roman period, there are many other interesting empires one can research—Egyptians, Mauryans, Macedonians, Assyrians, Chinese—and so on. It’s a fascinating world! I hope you found that interesting. Thank you for reading. Love fast-paced, exciting historical thrillers? Save two. Let a million die. I published an article on Medium on fighting the Writer’s Block. When you’re hit by the slump, perhaps there’s something you can get from the post. It’s no fun, I tell ya, but I think I’ve figured a way out of it. Follow my five-part blog series on Medium, on my usage of Ulysses for Mac. While I did start with OneNote, I have since moved on to Ulysses which is great for Novel writing. PART II — Organization — How I’ve organized my work for Ulysses to be as productive as possible. PART III — Customized Export — How I’ve organized and customized my stylesheets so I can publish eBooks and Paperbacks, each further customized for the specific book. PART IV — Workflow and Automation — Little useful tricks that reduce the pain in managing our work. I will also share a few time-saving actions that aren’t built into Ulysses, but can be done in a Mac. Can you use Microsoft OneNote to Write a Novel? After a few failed experiments, I tried Microsoft OneNote to write The Wrath of God. It has been an interesting experience, and worth reading about if you want a great free note taking tool. However, I have since moved on to Ulysses, which is fantastic for writing. But the lessons from OneNote are still valuable.